Now here’s an elegant solution to the school drop-off problem: A growing number of European cities simply prohibit cars on the streets surrounding schools at the start and end of the school day. The concept is called “school streets,” and it started in Bolzano, Italy in the early 1990s. Since then, school streets have spread from Austria to the U.K, according to the European Local Transport Information Service — and collision rates involving school children has decreased by half. About 45 percent of students in Bolzano walk to school every day, according to ELTiS. School Streets are marked with signs indicating the restricted hours. Fifteen minutes before school begins and for 15 minutes after it lets out, “school guides” — the European equivalent of crossing guards — place painted wooden signs signs at the streets blocking traffic, ELTiS. Other European cities are seeing the benefits. Two years ago, Edinburgh completed an 18 month “School Streets” trial at 11 schools. Data showed it produced a big drop in traffic: 3,179 fewer vehicles traveled the streets around the schools during a survey. Meanwhile, traffic was increased on surrounding streets by just 920 vehicles. Overall the experiment produced a three percent increase in the number of students walking to school and a six percent decrease in children being driven to school, the Scotland Herald reported. Vienna recent moved to make its school streets permanent after a six-month pilot improved safety and increased walking and biking among students. 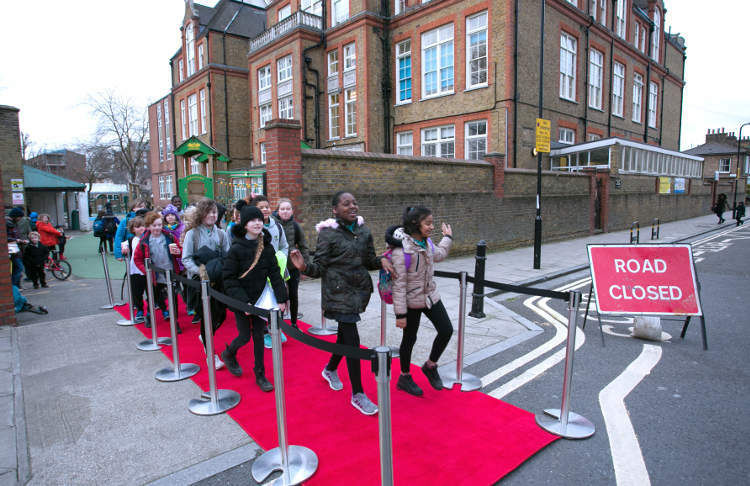 Meanwhile, in East London, School Streets have been implemented at five schools. At Millfield’s Community School in Hackney, teachers say the strategy also improves air quality for children. And parents say they like it. Obviously Europe is very different from the United States, but the arrangement is not unheard of here either. Today, when I was walking home from dropping my son off at daycare, I passed a street in Cleveland where through-traffic is restricted by a school. The crossing guard was out placing cones in the street just like this. Yes, listening to the “free money” pitches from two of the top for-profit ticket camera companies. Speed cameras are NEVER deployed to have most drivers reduce speeds below their safe and comfortable levels because it would cost too much with almost no offsetting ticket revenue. Opinion polls can get almost any result desired, if the questions are phrased cleverly enough. Votes tell the true beliefs and ticket cameras have lost 37 of 41 public votes. Note that many states make ticket cameras illegal to use to avoid the predatory for-profit ways they are actually deployed. Bills to bring them to Michigan in 2013 were defeated by the opposition from the Police Officers Association of Michigan, the ACLU, the Campaign for Liberty, Abate, the Mackinac Center think tank, the judges association, the National Motorists Association, skeptical editorials in both major Detroit newspapers, and others. As scary as re-engineering roads sounds, narrowing lanes via a new coat of paint is not exactly a huge cost. A clear question for you. An arterial has an actual 85th speed of 45 mph and a posted limit of 45. You could narrow the actual 85th speed down to 35 mph, simply by repainting narrower lanes. The 10 mph speed reduction would give pedestrians and cyclists a much higher chance of survival if involved in a collision. So WHY wouldn’t you? You guys really are a fringe group. When I lived a block and a half from a school in Los Angeles, I learned that even on days when my business at the university was done at 2, I should never try to bike home around 3 – for several blocks around, both sides of every street were lined with vehicles with parents in the car waiting to spy their kid and pull out. I got your long reply, though it never showed up here. For schools on higher speed arterials and collectors with actual 85th speeds in the range of 40 to 45 mph – how to protect the kids? The article said: “In response, the city put in “School Zone” signs with flashing lights that indicate a lower speed limit of 20 mph during school hours.” JCW – 1) This is part of the correct solution and “school hours” are 30 to 60 minutes before & after school, plus lunch hours IF kids are allowed off the school grounds. These limited hours will be far more respected than leaving the lights flashing at 10 am and 1 pm when drivers know that every kid is required to be in the building. 2) Officer ticketing is greatly preferred over camera bills sent in the mail weeks later to vehicle owners who may not have been the drivers, which have no consequences of points on drivers licenses, and which do not have interactions with an officer to explain and discuss the violations. Note that with the restricted hours, it should be possible to have officers pretty frequently. 3) Add crossing guards wherever significant numbers cross and educate kids to cross arterials & collectors at those locations. The idea of having student crossing guards seems inherently dangerous to me. Around here, the hysteria is high on abductions. To put it in perspective, if a child tells there parent that a man stopped his vehicle to talk to them, the police are called and a sketch is made. Heaven forbid you were a concerned parent asking if the kid was ok. Now your sketch is on Nextdoor and on facebook and the police want to “question” you. I saw this just a few weeks ago. I live in a neighborhood that is literally bordering a school. Parents will drive the 6 blocks to pick up there kid and it’s a madhouse. I don’t mind. I just ride my bike pass them and laugh. But the sad thing is, these kids grow up being used to being driven everywhere. Even in a town that has one of the lowest crime rates int he country. Why are signs noting a lower speed limit during school hours part of the solution if motorists don’t obey speed limits? If the restrictions are brief and reasonable, they get pretty high compliance. When they are obviously predatory for-profit rackets, they don’t. Overall and in many different scenarios, when traffic laws respect the normal and safe driving behavior of the vast majority of motorists, voluntary compliance is high. So if the speed limit was lowered to 20 mph on the retail/residential corridor near my home for the two miles or so leading into downtown, motorists would comply because it’s “brief and reasonable”? Sounds like the city should move ahead with that. I’m really curious how you define “normal and safe,” since a few minutes on any road I’ve ever been on would show those terms to be incompatible. There is a HUGE difference between a school zone that drivers will respect, and a normal area of commerce that does not justify an artificially low limit. So you’re saying drivers can recognize the need to drive slowly near a school when it is made blatant, but they are unable to recognize when a pedestrian-heavy urban environment warrants slower speeds no matter what kind of notice is given? What is it that prevents that? The very restricted hours for a school zone and the particular vulnerability of kids will get the respect of most drivers. Artificially low limits on arterials & collectors that are not necessary do not. When my Dad was stationed in Bremerhaven, Germany the 6th graders were the crossing guards for the rest of the elementary school, you would be assigned a week at a time with a partner, this was 1989-1992 when we were there. No problems at all. Those streets are engineered to be safe. quite often that overzealous compassion is applauded, even when we know it is causing more harm than good. you must be a great person if you panic like that and call the police. its annoying and contour productive but virtue is more important than most things. Why post about arterials in discussions about school zones? Clearly all cars should be policed at 20mph to not kill peds and cyclists. As long as we all agree that people are important and cars are not, great! Faster speeds on interstates, highways, and even arterials is probably fine…where there are separate provisions for bikes and walkers. Schools are often located on main collector and arterial streets. They SHOULD have special school zone limits for up to an hour before and after school, and at lunchtime if kids are allowed off the school grounds. Michigan allows limits down to 25 for the special school zone times. The zones work the best when the limits & times are clearly signed and accompanied by flashing lights during those limited times.